Yesterday, an acquaintance of mine/friend of Stephen's committed suicide. It was sudden and hard to take. In the late morning, he had posted a picture of his dogs that he loved very much. By early afternoon, he was found dead... or rather, his note was found. This was a man who had survived much and had devoted his time to taking care of himself and trying to help others that had battled drug and alcohol addiction through counseling. He was well respected for what he did and loved for his spirit, ever positive. Because of that, it's tough to handle his suicide. He was an inspiration to many and had offered a hand to my boyo when he needed someone to listen and understand. 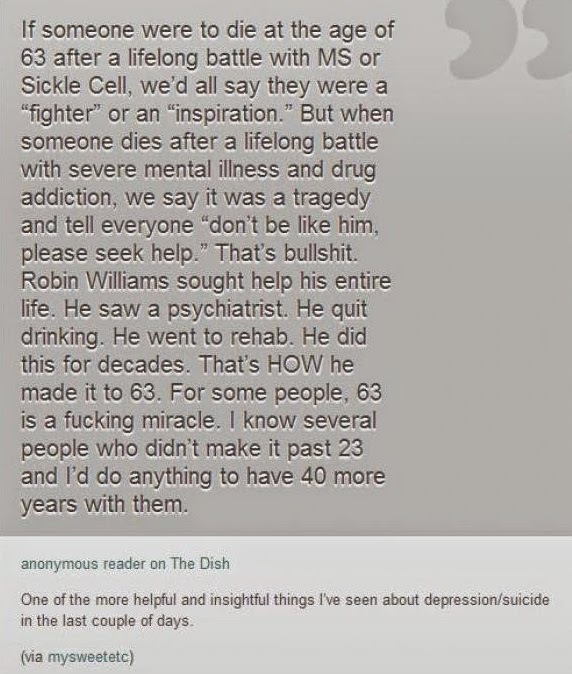 So why suicide? How did he get there? It's a question I've asked a couple of times before. The first time was when a friend hung herself back in... 2006? 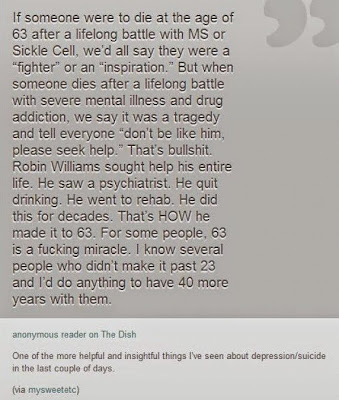 Not to say that there weren't any suicides - successful or not - prior to this but this was the first to make me ask this question. We had a lot of traits in common and we shared a last name of sorts; hers was given and mine via my mother. We had a propensity to get ourselves into sticky situations, to throw caution to the wind, and to crash just as suddenly. She was bipolar and took meds... until she didn't. I was not yet diagnosed. Even then, though, I had to ask... how did she get there?? What made her do it? And scarier still, if she got there, when will I get that bad? I loved life too much to ever get there, even in the darkest of times, I told myself. I never wanted death. I knew then that there was more to what I felt, yet I still didn't equate it with Bipolar Disorder. Due to that realization, I had to wonder, when will that be me? As though I had a degenerative disease... and maybe in a sense, I did. Who knows? Unmedicated and undiagnosed, I might have. Then again, the Unsinkable Ceci may not have ever had the reasons to get there. I had survived a lot... seriously A LOT, but even when it looked so dark and I didn't think I would get out of it, I never contemplated death. So now, I'm here again, looking at the question of... why? And to a degree, what makes me different? Will I still get there one day? People always talk about making sure you know you can reach out to loved ones, to remember that you're not alone. But... my bipolar friend, my cousin (I wrote about this a couple of years ago), and now this friend, have reminded me that it's not always about our support system. Well, the only one I can say that about for sure is my cousin but I have to extend it as a possibility to the other two. Both had people who were there for them, who they talked to... or in as much as they could, possibly keeping back the worst as we're all prone to do. Sometimes... sometimes it's about the battle and what one can take. Sometimes they just can't fight anymore and don't want to keep living with it. Sometimes... sometimes it's about how long we can survive, I suppose. Maybe I'm wrong... but I know for Adrian, that was it. He said it to his mom... and it makes perfect sense to me. I'd want out of this, too, if the battle was too much to bear. As to me, I don't know. I'll just keep battling because this is not a battle I want to succumb to; this - the ups and downs - means too much to me to stop fighting.